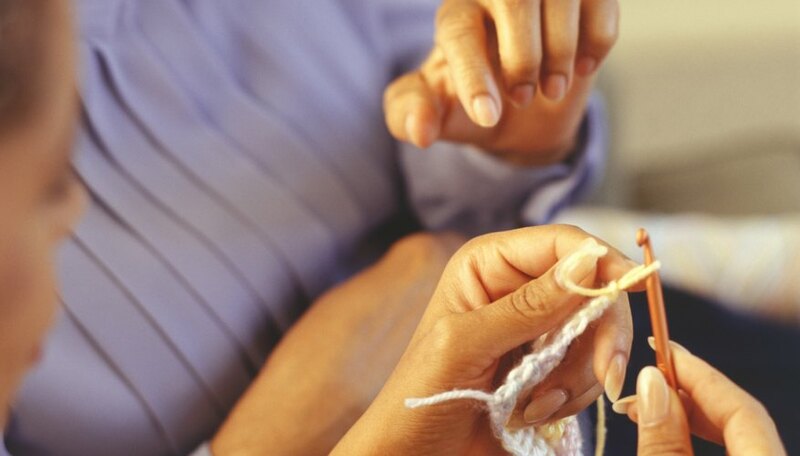 Crocheters are used to gentle ribbing about their craft, and sometimes return the favor by making good on requests for unusual items, such as crocheted underwear. But whether for a joke or in earnest, crocheted boxers can be practical and comfortable, especially in cold weather. A slight adaptation to a standard crochet stitch creates an elastic fabric, and is simple enough that many beginners do it by mistake. Your crocheted boxers may begin as a joke or a dare, but they might end with the recipient requesting another pair. Tie a slip knot around the crook of the crochet hook. Work 25 chains, not counting the slip knot. Work 24 single crochet stitches. Turn the work, and repeat the row of single crochet until your work is at least 4 inches long. Cut the yarn. Measure the number of stitches per inch and rows per inch. Multiply the number of stitches per inch by 12, and add one. This is the number of chain stitches you will work for each leg. Multiply the number of rows per inch by half your recipient's waist size. This is the number of rows you will work for each leg. Subtract one inch from your recipient's waist size. Multiply this number by the number of rows per inch. This is the number of rows you will work for the waistband. Chain the stitches for the right leg. Work a row of single crochets. Chain one, turn the work, and crochet into the back loop only for the second row of single crochets. Alternate rows of working into both loops and working into the back loop until you are 2 inches away from the end of your work for that leg. Decrease one stitch at the beginning of each row for the remaining rows. Cut the yarn and pull the end through the remaining loop at the end of your work. Chain and crochet the left leg in the same manner as the right. Chain eight stitches for the waistband, and work single crochets into the back loop until the waistband is 1 inch smaller than your recipient's waist. Sew the boxers together using the yarn needle and the same yarn you used for the boxers. Sew the inside seams of the legs. Sew the legs together at the groin. Sew on the waistband. Cotton-elastic blend yarns are the best yarns for this project.